Sarah Nader - snader@shawmedia.com Construction workers start the demolition of the old McCullum Lake village hall located on Orchard Drive on Tuesday, March 6, 2012. A new 6,000 square foot village hall will be built in the location and should be completed this summer. 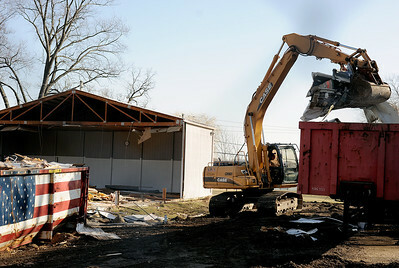 Construction workers start the demolition of the old McCullum Lake village hall located on Orchard Drive on Tuesday, March 6, 2012. A new 6,000 square foot village hall will be built in the location and should be completed this summer.